With Pancake day just around the corner, now's the time to get creative in the kitchen and serve up something other than the normal everyday kind of pancake. Come on, get cooking! With that said, personally I actually like and prefer pancakes with a just sprinkle of sugar and a good squeeze of lemon; I know, I'm easily pleased! First job is to get yourself a good decent non-stick frying pan that's up to the job. This rather nice looking frying pan from Judge Cookware Continental range is the very fellow. 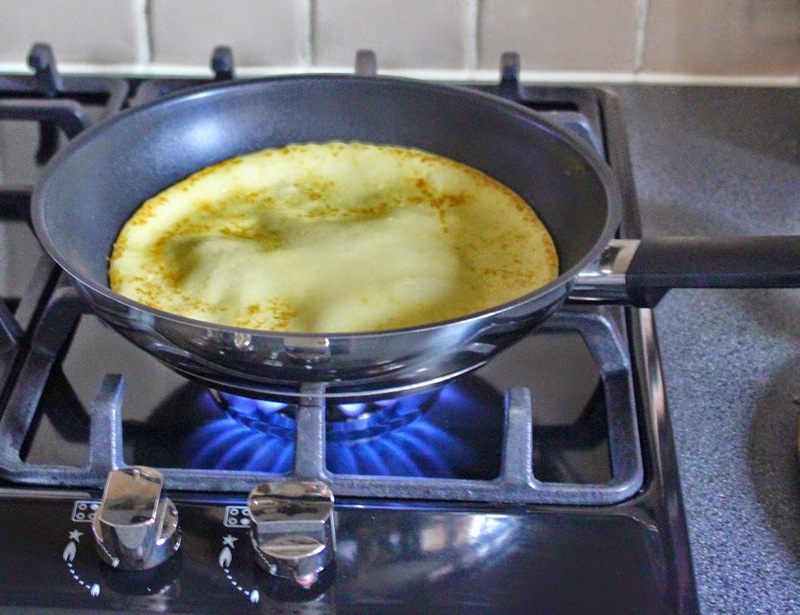 This pan heats up quickly making it perfect for pancakes. Of course this frying pan isn't only for pancakes. Great for everyday use and perfect for that Saturday morning bacon sandwich or a good fry up. Available in 3 sizes (20cm/24cm/and 28cm) personally I think the 24cm is perfect for pancakes. The Judge Continental range is optimised for induction - the thermic base gives even heat distribution on ALL hob types. 18/10 Mirror-polished stainless steel and the interior in non-stick. It's oven safe too up to 180°C/350°F/ Gas Mark 4 which is brilliant news (means you don't have to transfer to another pan to finish certain dishes in the oven) and it's also dishwasher safe but so far I haven't put mine in the dishwasher as it really washes up very easily in nice hod sudsy water. Rinse and dry and it's good to go. I love 'Stay Cool' black phenolic handles. You need a good non-stick pan for this. Just melt chocolate in a bowl over a pan of boiling water. Then drizzle over the cooked pancakes. Heat up your frying pan and add the orange slices along with the sugar and runny honey. Carefully turn the orange slices after a minute or so, you will see the sugar and honey melt and the oranges begin to colour. Take care they don't burn. Add the orange juice and cook for a few seconds. Remove and serve. Sift the flour and salt into a large mixing bowl. 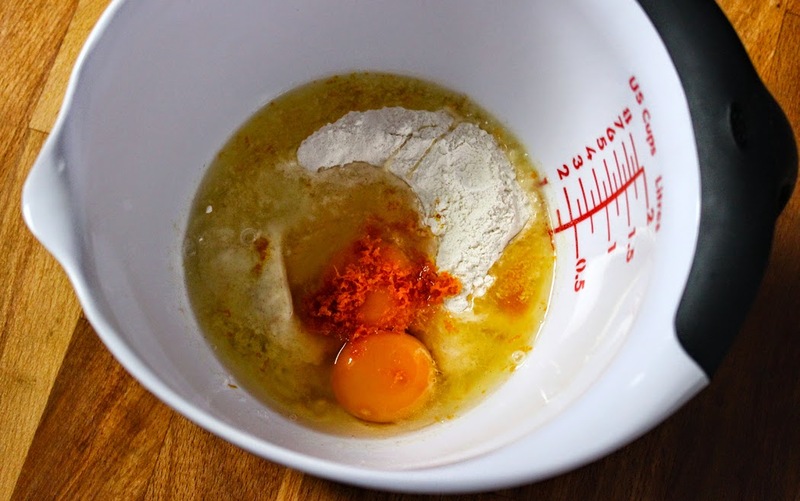 Make a well in the centre of the flour and break the eggs into it and add the orange zest. Then whisk in the eggs with a balloon whisk. Bring in the flour from around the edge of the bowl so it all gets well mixed together. 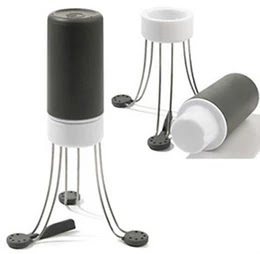 Now you can gradually add small quantities of the milk and water mixture, whisking all the time until all the milk and water has been added and it is quite smooth - no lumps please! You will now have a quite thinnish batter. When that's done, transfer the mixture into a jug so it's easier to pour. Using a piece of kitchen paper dip it into your melted butter and use this to grease the frying pan. Get the pan really hot and then turn the heat to medium. Pour a little of the pancake batter into the hot pan - enough to almost cover the bottom completely. You don't want the pancakes to be too thick. As the batter goes into the hot pan, tip it around from side to side to get the base evenly coated with batter. The pancake will only take a minute, if that to cook. Now flip the pancake over using a pan slice and the other side will need a few seconds to cook. Once cooked the pancake will have nice golden spots on. Now slide the pancake onto a serving plate. Bring in the flour from around the edge of the bowl so it all gets well mixed together. Now you can gradually add small quantities of the milk and water mixture, whisking all the time until all the milk and water has been added and it is quite smooth - no lumps please! You will now have a quite thinnish batter. When that's done, transfer the mixture into a jug so it's easier to pour. The pancake will only take a minute, if that to cook. Now flip the pancake over using a pan slice and the other side will need a few seconds to cook. Once cooked the pancake will have nice golden spots on. Now slide the pancake onto a serving plate and enjoy. Disclaimer: All thoughts and opinions are my own. I was not required to write a positive review. I don't make pancakes for dessert (instead of breakfast) nearly often enough. Love these flavours. I do love pancakes. I really ought to make them more often, so quick and easy and tasty! We have pancakes a lot in our house... pretty much every weekend for breakfast!!!! Chocolate and orange is such a lovely flavour combo, i'll have to try it out. I'm like you though, it's hard to beat the classic lemon and sugar! 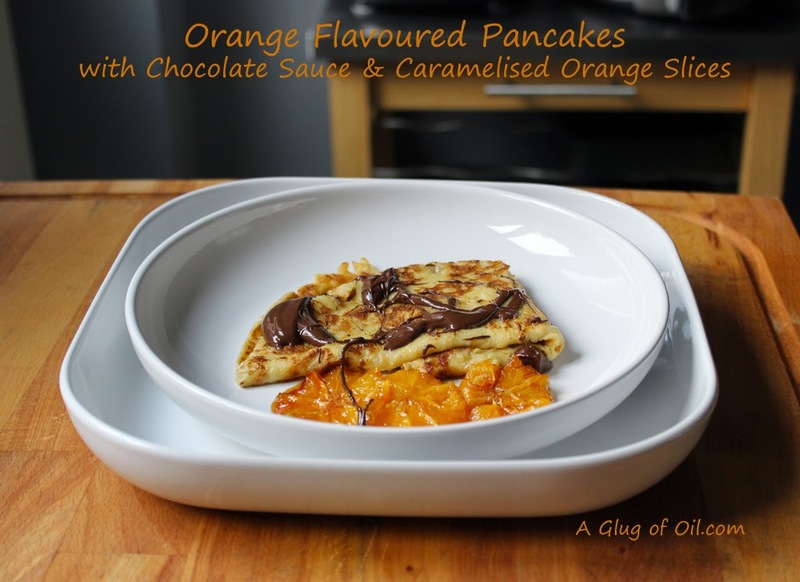 Mmm, orange and chocolate - definitely a winning combination and not one I've tried as a pancake topping before. I shall be trying this soon! Oh yes please, I'll have some of those. Awww, I want pancakes NOW! These chocolate and orange ones look lush. Guess what, you showed up in my email this morning from a post you did way back in 2009!!! It was called "Chinese Curry - Just like the takeaway!" I must have been subscibing to it, lol...Anyway, as soon as I saw it, I just had to pop by to say HI! Yes, indeed, Pancake Day is right around the corner and your refreshing orange flavored pancakes sound dee..li..cious!!! 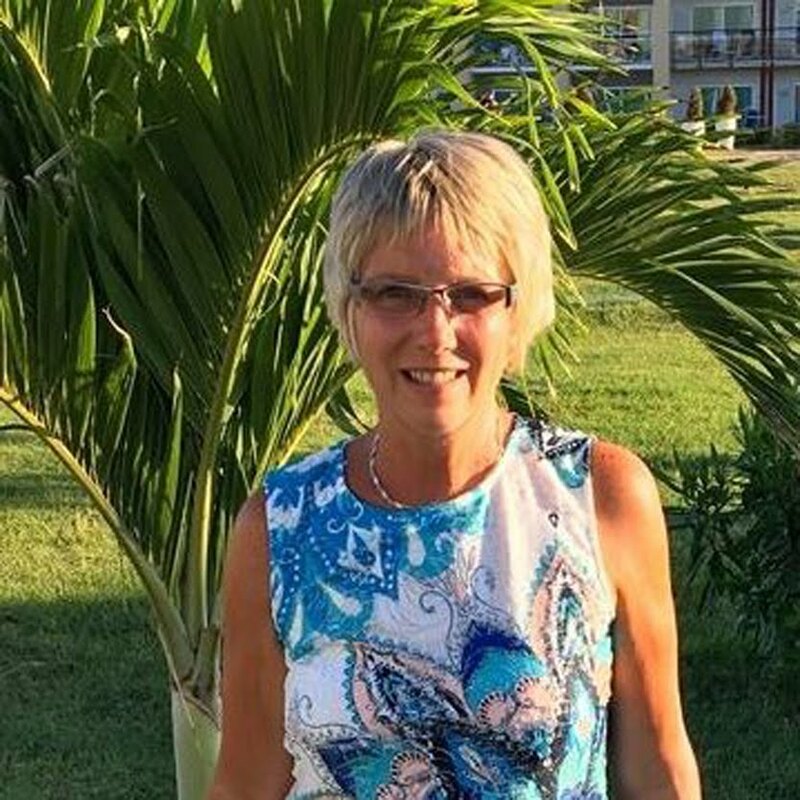 Thank you so much for sharing, Jan...Hope all is well in your corner of the world.